Sonar Technicians aboard the guided-missile destroyer USS The Sullivans (DDG 68) monitor sonar equipment during the Southeastern Anti-Submarine Warfare Integrated Training Initiative. This month the U.S. Ninth Circuit Court of Appeals decided that rules governing the U.S. Navy’s use of a specialized low-frequency sonar for tracking submarines violated laws for the protection of marine mammals. The U.S. Navy’s Surveillance Towed Array Sensor System (SURTASS) Low Frequency Active (LFA) sonar system is deployed on four civilian-crewed naval auxiliary ships to find and track submarines at ultra-long ranges. But because powerful active sonar can severely injure whales and other marine mammals, and has been linked to mass-strandings and beachings around the world, its peacetime use is limited by environmental regulation. There are two types of sonar, active and passive. Passive sonar is simply “listening” for the sound that a ship or submarine makes as it travels through the water. Active sonar sends a pulse of sound energy through the water and then listens for that sound to “bounce” off a target submarine and travel back towards the originating vessel. Because it doesn’t transmit any sound itself, passive sonar is generally preferred because it does not give away the position of the listener. This recent court decision, the latest in litigation reaching back over 15 years and spearheaded by the Natural Resources Defense Council (NRDC), an environmental NGO, was not against the Navy itself, but the National Marine Fisheries Service (NMFS). As the federal agency responsible for implementing ocean environmental legislation, such as the Marine Mammal Protection Act, the NMFS issues the rules and authorizations under which the Navy operates its sonar during peacetime (environmental restrictions on the Navy are mostly suspended during war). The Court found that the NMFS’s principal failure was the standard it used to identify Offshore Biologically Important Areas (OBIA). These are stretches of ocean important to the feeding, mating, calving, or migrating needs of marine mammals. The NMFS rule restricts the use of LFA in these areas unless “operationally necessary” to continue tracking an existing submarine, or to detect a new contact believed to be in the OBIA. Presumably, this exemption exists to prevent adversary submarines from taking advantage of the OBIAs (whose geographic coordinates are public) to escape tracking in real-world national security situations. The plaintiffs’ complaint was that the OBIAs listed by the NMFS were inadequate to ensure Navy sonar had the “least practicable adverse impact” on marine mammals, the standard required by law. OBIAs were also at the center of two previous litigations against the NMFS LFA rules. The first rule listed only three areas, and the second only ten, finally increasing to the current rule’s 22 OBIAs following litigation in 2007. But the source reference that NMFS used to identify OBIAs lists 367 possible such areas around the globe. Against the recommendation of some of its own scientists, the NMFS’s final rule made the assumption that areas where data was sparse or missing could be excluded from the list because their importance could not be positively demonstrated, even if other hydrographic information indicated they were likely to be. In other words, the NMFS assumed the absence of data was the same as the absence of whales. The Court found that NMFS’s failure to apply the looser, more precautionary assumptions its scientists recommended, even if potentially over-inclusive, did not meet the “least practicable adverse impact” standard. The result was what NRDC called “a virtual blank check” for the Navy to operate LFA sonar in many areas that science could be reasonably sure were important marine mammal habitats. However, advocates for stronger rules and mitigations for sonar use have long argued that protecting marine mammals and national security requirements are not mutually exclusive, and the data appears to confirm that. The legal complaint was against the extent of the Navy’s authorization on paper, not on its actual operations. While the Navy may have had a “blank check” from the Fisheries Service to operate LFA sonar across an estimated 70 percent of the oceans, so far it has been slow in cashing it in. Until NMFS publishes a revised and expanded list of OBIAs that meets the Court-mandated standard, it isn’t clear the Navy’s current operations will be significantly affected by this new decision. Each of the four LFA equipped SURTASS ships (compared to the over 150 ships carrying less powerful Mid Frequency Active sonar) is currently authorized to transmit LFA up to 432 hours each year, for an annual 1,728 fleet-wide hours of LFA “pinging.” This is a cap on total use, and based on the three years of data available under the current rule, the Navy has utilized far fewer hours. In 2013 the Navy pinged LFA for only 47.3 hours of the 1,728 allowed. In 2014 it used only 38.6 hours, and 51.6 hours in 2015. In other words, the Navy consistently uses less than 3 percent of its allowed LFA hours. The reports also show that while the rule left 70 percent of the ocean under-protected by OBIAs, actual use was comparatively geographically constrained. The Navy’s EIS indicates that “using these sonar systems [LFA] could occur in the Pacific, Atlantic, and Indian Oceans, and the Mediterranean Sea.” However, the Navy’s annual reports to the NMFS indicate it has only operated LFA in discrete parts of the Northwest Pacific Ocean, including the Sea of Japan, East China Sea, and South China Sea, as well as a range area off Hawaii. The revelation that SURTASS ships operated almost exclusively around the Chinese coast and Western Pacific Ocean also highlights one of the more extraordinary results of the Navy’s efforts to comply with environmental legislation—the window it provides into an otherwise little-publicized submarine surveillance program. In 2009 the public got a sideways introduction to the LFA program when the USNS Impeccable was harassed by Chinese ships near Hainan Island in the South China Sea (but was really only one of at least four major incidents of SURTASS ship harassment by China). 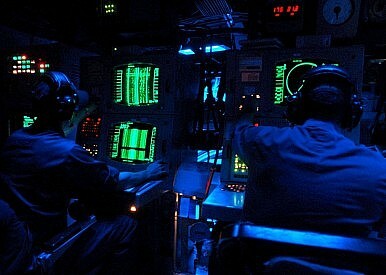 Described then as a “surveillance ship” and sometimes euphemistically as a “survey vessel,” the Navy’s EIS makes clear that SURTASS LFA’s purpose is to detect and track potential adversary submarines (as well as providing technical and operating information for the system, if not specific tactics and operational details). This likely explains China’s sensitivity to the SURTASS ships’ presence in the South China Sea, near the South Sea Fleet’s submarine bases on Hainan island. It remains to be seen if the next round of OBIAs and mitigation measures will overlap with the Western Pacific areas SURTASS ships have been operating in under the current rules as the United States works to balance the Navy’s responsibility for environmental stewardship of the oceans and its national security interests. New contract augments old Cold War "SOSUS" arrays.